The Hill family purchased an IHB Home with Realtors, Kristen Rabell and Rebecca Johnson, a few years back. Last October the family welcomed twins much earlier then expected. McKenzie and Collin were just as precious as could be, but due to their premature birth they had to spend months in hospital. Thankfully they are home now, but McKenzie is on an oxygen tank and they live in an area where down trees, power lines, and brownouts can occur. Add on top of that, we are headed into storm season where power can go out for a few hours, days, or even a week. Rabel Realty Group is committed to helping raise the funds, provide, and install a generator for this family in need. We have called around and have found out what it would take to make this happen and now we are asking for your help in making this dream happen for them. The dream of not living in fear for their daughter's breathing troubles and potential power outages. Even the smallest of donations will help and we appreciate your consideration. For years my husband and I tried to have children together and after years loses and fertility treatments we were finally pregant. I started bleeding early and was on home bedrest till 20 weeks when McKenzies water broke. (That was the start to the page) on October 5th 2015 i woke up and everythjng changed. I knew at least one bag of water broke and ran to the hospital. It was confirmed McKenzies water had broken. Doctor after doctor came in with only bad news. They sais 50% would deliver within 24 hours and 30% on the ones left would deliver with in 7 day. If that happened would would be allowed to hold them but they couldn't save either baby. We cried and prayed. We had to make it past 23 weeks before they were allowed to go to the NICU and they would try to save them. We were placed on hospital bedrest were we spent the the 8 weeks praying every day to just make it to the next day. Then at 28 weeks they were born. Just hours after they were born the head dr in the NICU came in and told us McKenzie would not live thru the night. Her lungs were not strong enough. She did survive the night but the next days her left lung collasped they again ask if we wanted them to put a chest tube in as they didnt think she would survive the weekend. We said yes and they did. Collin was doing great small and needing some help to breath but stable. McKenzie did survive the weekend but was no where close to stable. She now had a grade 3 brain bleed. Thanksgiving weekend was over and we sat by their beds nonstop listening to the doctors report and looking for the next step. 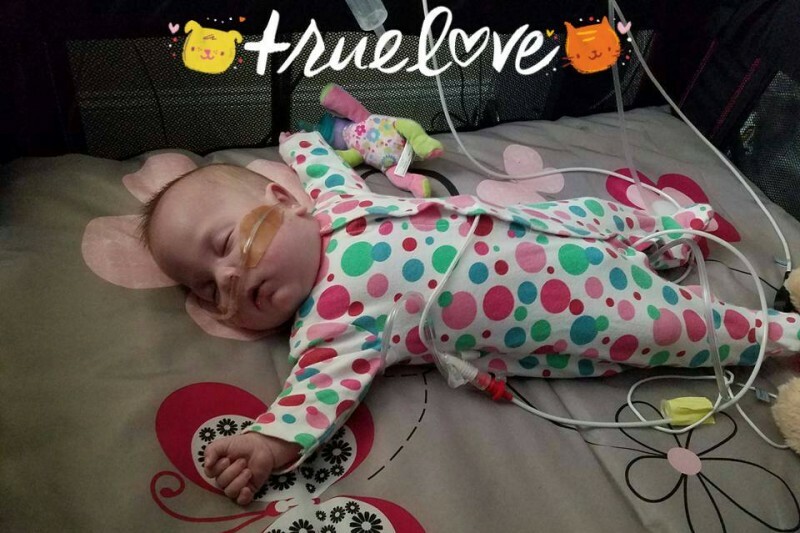 McKenzie was on the oscillator which is the most powerful vent yet the gentlest on her lungs. Monday came and the very doctor that said she wouldnt live the night was back and when he came to the bedside and found out it was still here he was truly surprised. I will never forget him saying "wow this baby is still here". Yes she is I replied. But now we had another problem her brain bleed. She was still maxed out on meds to help her and she was very very critical. Every day we sat with them both. Her dad took off 5 weeks but we couldnt afford to take off any more because he was our only income and we were now behind on bills. McKenzies bleed was checked every 7 days. Days felt like weeks. We couldn't touch her much because her sats would drop. She just couldnt handle it. We sat and talked to her. Told her how strong she was and great her life was going to be we had faith she would be okay. Every Tuesday the scans showed her bleed was getting worse and she now had Hydrocephalus (fluid on the brain). Her Neuro surgeon was called in and they wanted to take her to surgery. She needed a shunt placed in her brain to drain the fluid. When she was 6 weeks and 2 days old I got to hold her for the first time. She was off the oscillator and on CPAP. This was a huge step for McKenzie and was now considered stable. It was while I was holdering her for the first time her surgeon came in and said she wanted to take her to surgery as soon as she hit 3 and a half pounds. For the next week we watched as she gain a few ounces each day and was closer and closer to brain surgery. The day came she was 3 and a half pounds and off she went for her first surgery. She did great but momma was a mess. We didn't know how long she would be back on the vent or how her lungs would handle her being put under and on their machines. She did great and was off with in 12 houses. A couple weeks went by Collin was getting ready to come home and McKenzie was getting stronger and stronger till one day i walked in and she wasnt okay. I knew the second i walked in something was wrong with here. Everybody said she was ok but i knew she wasnt. I cancelled my doctors appointment that day and told my husband i wasnt leaving her. As the day went on she got worse and worse. They finally started running test and her shunt was infected. The nexted morning she was rushed to surgery to have it removed. This surgery didnt go as well she didnt wake up for 5 days. It was the longest week of my life sitting at her bedside praying for her to wake up again. She was just letting the vent breath for her she wasnt even trying. Days turned to night then to day again and we sat with her. She did finally wake up and slowly got back to herself again. It took 45 days to clear up the infection in her brain. We finally got the infection cleared and she had to go back to surgery to have a new surgery placed. She went and again did great. Mommy was as always a mess. He was doing well then she started to slowly decline again. We feared it was another shunt infection but nobody could figure out why. Over the next 4 weeks she got worse and worse till she was back on the vent. She ended up be maxed out on the vent and on meds again and the doctors started pulling us aside and telling us they were out of things to offer her again. They didnt believe she was going to come off the vent again. They started pushing us to give her a trach and leave her on a vent. We said no we were going to give her a chance and see how she can do on her own before we decided to give up and trach her. Day by day sje slowly weaned on the vent again and was making progress. I sat with her everyday and prayed to hear her voice again. Prayered for her lungs her strength her doctors and our strength and answers for how to best support her. The day came and she was able to come off the vent AGAIN. Her sweet horse cry brought me to tears. Day by day she weaned down on the CPAP and was making progress again. Now she needed to go to surgery again and have a nesson and Gtube placed. That way we can feed her. Surgery went great and she recovered quicker then any before and continued to wean on her CPAP. She got to nassel canula and has been on it a couple weeks now. She was able to come home this past Thursday. She is on a heart monitor, sat monitor, feeding pump, and oxygen machine. Before leaving the hospital they did another MRI and she still has fluid on the left side of her brain so she may have to have yet another surgery in a few weeks. But for today she is alive and she in home. Im thankful for where we are today. Thank you so much everyone! This is really exciting and touching to the family. They are just overjoyed! Prayers and blessings for McKenzie....she is beautiful.